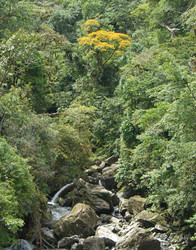 Tree from Dimitrov and Hormiga (2009). 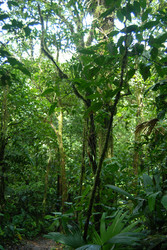 Cyrtognatha species live in cloud forests in the Neotropical region, including some of the Caribbean Islands (for distribution map see Dimitrov and Hormiga, 2009). Most of the species are bright green or yellowish colored, with numerous reflective guanine spots on the abdomen that make the animals look shiny. In a recent taxonomic revision Dimtirov and Hormiga (2009) circumscribed the genus to include 21 species, more than half of them new to science. Given that most of the species are known from just a few museum specimens and that the genus is distributed in some of the most biologically diverse areas in the world, it is predicted that many species of Cyrtognatha remain to be discovered. Cyrtognatha species can be easily distinguished from other tetragnathids: adults of both sexes and juveniles always have a line of modified macrosetae on the retrolateral surface of the posterior lateral spinnerets. This character is particularly relevant when dealing with inmatures as it allows correct generic determination. Another diagnostic feature of Cyrtognatha, found also in juveniles, is the presence of in a single row of two types of trichobothria on the fourth leg femur: short and smooth trichobothria are alternated with longer feathered ones. In addition, unlike other tetragnathines, males of Cyrtognatha have an enlarged and very complex embolus which in most species also has a well developed metine embolic apophysis. 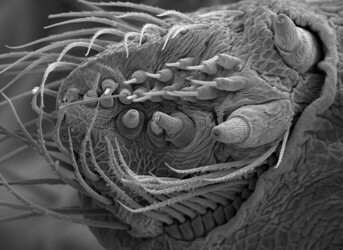 Like other tetragnathines, Cyrtognatha females have haplogyne genitalia but the spermathecae are vestigial and the sperm storage function is undertaken by a specialized unpaired organ known as the "posterior sac" (Dimitrov et al., 2007). Nothing is known about the courtship behavior and copulation in Cyrtognatha. Cyrtognatha species build horizontal, in some cases vertical, orb webs with relatively few radii and spiral turns and an open hub. 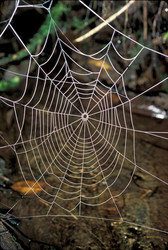 The spider usually stays at the hub, but when disturbed it runs from the web and hides in the surrounding vegetation. The first phylogenetic study to include a representative of Cyrtognatha was that of Álvarez-Padilla (2007). At that time some of the Cyrtognatha species were placed in the genus Agriognatha (which is now considered a junior synonym of the former genus), and thus in Álvarez-Padilla’s work the name Agriognatha was used. 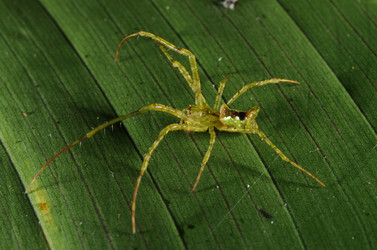 Álvarez-Padilla (2007) found that Cyrtognatha belongs in the subfamily Tetragnathinae. Recently, Dimitrov and Hormiga (2009) have completed a monograph and cladistic analysis of Cyrtognatha and the tree presented here is taken from their work. 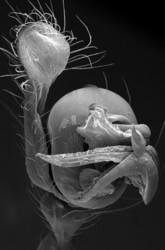 Cyrtognatha is the most basal clade of Tetragnathinae, a result that has been corroborated by analyses based on DNA sequences, morphological and behavioral data (Álvarez-Padilla et al., 2009). Dimitrov and Hormiga (2009) have defined four lineages within Cyrtognatha, informally known as the quichua, morona, orphana, and bella clades. Álvarez-Padilla F., Dimitrov D., Giribet G., Hormiga G. 2009. Phylogenetic relationships of the spider family Tetragnathidae (Araneae, Araneoidea) based on morphological and DNA sequence data. Cladistics 25: 109-146. Dimitrov D., Álvarez-Padilla F., Hormiga G. 2007. 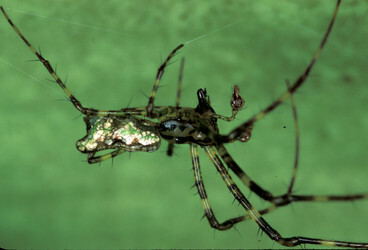 The female genitalic morphology of the orb weaving spider genus Agriognatha (Araneae, Tetragnathidae). Journal of Morphology 268: 758-770. Page: Tree of Life Cyrtognatha Keyserling 1881. Authored by Dimitar Dimitrov and Gustavo Hormiga. The TEXT of this page is licensed under the Creative Commons Attribution-NonCommercial License - Version 3.0. Note that images and other media featured on this page are each governed by their own license, and they may or may not be available for reuse. Click on an image or a media link to access the media data window, which provides the relevant licensing information. For the general terms and conditions of ToL material reuse and redistribution, please see the Tree of Life Copyright Policies.